What does it mean to live a good life – a life full of meaning and purpose? How do we prosper in times of great uncertainty? What role does resilience have in human flourishing, leadership, and organizational prosperity? As whole nations and individuals strive to achieve greater levels of well-being, living and leading with resilience allows us to embrace all that makes life worth living, even in the face of adverse times. 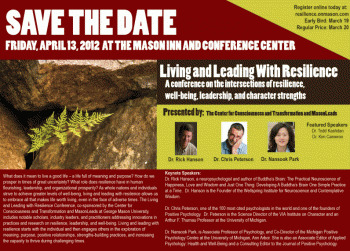 The Living and Leading with Resilience Conference, co-sponsored by the Center for Consciousness and Transformation and MasonLeads at George Mason University, includes notable scholars, industry leaders, and practitioners addressing innovations in practices and research on resilience, leadership, and well-being. Living and leading with resilience starts with the individual and then engages others in the exploration of meaning, purpose, positive relationships, strengths-building practices, and increasing the capacity to thrive during challenging times. We would like to offer a special thank you to the following departments for their support: The Leadership Education And Development Office, University Life, and New Century College.